It is the ideal home for an aspiring James Bond villain, or an anxious survivalist seeking a refuge that can withstand an atomic bomb. A former US intercontinental ballistic missile base - with a network of underground tunnels and silos, but no nuclear warheads - is on sale on eBay for $1.5m (£750,000, 1.06m euros). Located in a remote corner of Washington state and still ringed by its original barbed-wire-topped fence, the 56-acre site is being marketed as a "gorgeous" property and potential resort. Bari Hotchkiss bought the former base 10 years ago from owners who obtained the property in the 1970s, after the US government deemed obsolete the Titan missiles it was built to launch. "We used to use it as a summer camp, for our kids and their friends," he told news agency AFP. "The only limit is imagination. We've always wanted to see it turn into a summer camp or resort camp," he said. Mr Hotchkiss says there are 18 former Titan bases, most of which were sold off. But his base, he says, is one of the best preserved. "Most of those former bases are much much smaller, and most all of them have water problems with water leaking in them. So they're filled with water or so wet there is terrible rust, and ours is dry. Portions of our missile base look like it's built last year," he said. Much of the Cold War era technology was stripped from the site by the military, and to make much of the underground network useable would require several million dollars. "If you only need one or a couple of the buildings to begin with, several hundred thousand dollars might do it," Mr Hotchkiss told AFP. A number of other former US missile bases are also on the market. 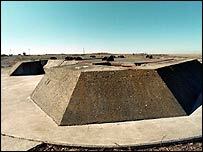 The website missilebases.com describes the buildings as "castles of the 20th century". Designed to withstand nuclear attack, these unique properties "bring new meaning to the word 'shelter'," it says.